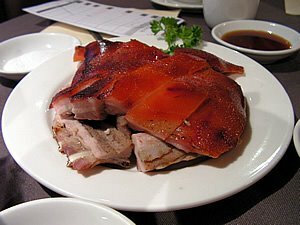 The Aristocrats; another fantastic Italian class; night out in the city with Nat, starting with dinner at trip-down-memory lane Bill and Toni; visit to the cemetary for granddad's anniversary; yum cha (see below); the art gallery for a free screening of The Gleaners and I - loved it. Too tired to continue onto the Pissarro exhibition so will see it this week. 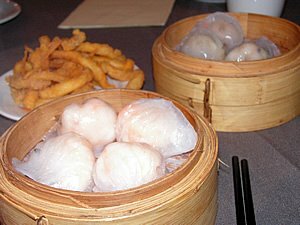 Yum cha is my favourite food group alongside pasta, so it was almost life-changing to discover what could very well be a new 'best'. East Ocean has always been my favourite, despite some other very good experiences. We'd heard good things about Zilver, the former Silver Spring, and so Kath, Jay, Marianna and I gave it a go. There's just something good about it. The food was very fresh, including the best salt and chili calamari ever had at yum cha. It was so good another plate would easily have gone down a treat. 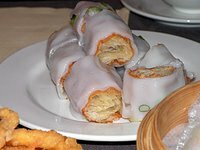 A few interesting new dishes, like deep-fried pastry cut up and wrapped in rice paper served with dark vinegar. There's also suckling pig (yum) and Peking duck pancakes but they came around too late. Nothing came out lukewarm or soggy, the tables are nice and big with comfy faux leather chairs, and we didn't wait long. A little pricier than East Ocean, but yum cha is always good value. They also have a cocktail bar with yum cha bar snacks in the evening - this has me written all over it. Almost enough to make me see a musical next door at the Capital Theatre. Beautifully fresh, plump har kow and scallop dumplings, and the most more-ish salt chili calamari. Deep fried pastry wrapped in rice paper, topped with spring onion. The loves of my life - mango pancakes. The deep friend pastry is what we called "Deep fried Chinese bread sticks" when I was in China. 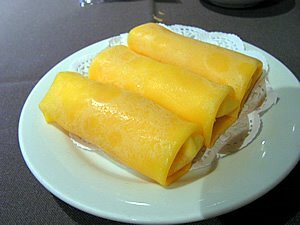 You would see people cooking these on the street in China, and selling them to people on their way to work, sometimes dunked in a cup of soy milk. They weren't wrapped in rice noodle though like your Yum Cha ones were. Now I really want Mango Pancakes. Yum, yum, yum. Oh, I'm drooling. Literally drooling. wow...sounds (and looks) amazing...my stomach is strirring as i write this.